Being the shark that I am, I usually have a “to-do” list for my commute. I go through my mail (that I pick up en route to the bus), check my email, clean out my text messages (whatever has been addressed gets deleted), write down goals/tasks and random thoughts in my planner, write a blog post, etc…(this is why my mother calls me a shark, I’m always looking for something to do!). After all this is done or sometimes when I just don’t feel like being productive, I scroll through Pinterest. When it comes to social media, I rarely check my Facebook or Twitter, but I stay on Pinterest. 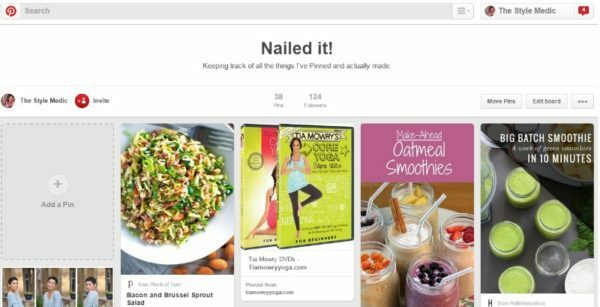 As much as I enjoy just scrolling and pinning, the shark in me has found a way to make Pinterest another place ‘to do’ stuff. Now I’m on Pinterest doing research, making sub-boards for the goals on my vision boards, and planning anything that comes to mind. What good is all this pinning if there is no one to hold me accountable for following up you ask?! Well, there is something to keep me accountable, my ‘DONE!’ board. This is where I move pins after I’ve done them. I made that baked apple French toast, DONE! I put together my closet’s version of that look, DONE! I watched that paper flower tutorial, DONE! You get the picture. (Pun so intended!) Who says you can’t enjoy social media and be productive at the same time? Not the shark! I say, pin yourself silly, try some new things, move those pins to your ‘DONE!’ board and show out! So what say you? Do you keep track of the pins you’ve tried? Check out our done boards and leave a link to yours below so we can share the love! I love Pintrest, but, it's mind boggling. How in the world do folk think of all these things? I've only ear marked a few things that I seriously intend to do, but, I do like looking at the possibilities. You guys are absolute sharks and really should have shark pumps!